In this tiny city, you will be amazed at how many Hong Kong newspapers there are. Not only the local ones, but also the international ones for both newspaper and magazines. They could be in their original languages, such as, English or translated into Chinese. 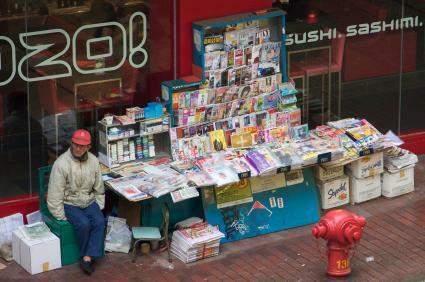 A typical Hong Kong news stand - There are thousands of them. According to Wikipedia, Hong Kong "has one of the world's largest press industries and is a major centre for print journalism." It is NO exaggeration at all. I am very proud to say that most Hong Kong newspapers don't have personal opinion from the journalists or newspapers in favor of certain political parties. And they are always true to the facts. Journalists only express their opinions in the editorial columns, not inside the news articles. There are only 20 HK newspapers, including financial and religious ones. There used to be more. Plus, one newspaper company often published 2 editions of newspapers. One in the morning and the other one in the evening. My grandfather (from my mother's side) used to buy at least 4 different newspapers a day. It used to be HK$1 a piece and that price had lasted for a long, long time. As of Sep 2012, it only costs HK$6 for each, except South China Morning Post is HK$8. Since the internet era, these newspaper companies have started closing down. b) South China Morning Post , a.k.a. SCMP. There are only 2 English newspapers in Hong Kong. This is the no. 1. I ordered this from grade 7 - 13. I loved the student edition, Young Post. The vocabularies used in this newspaper are more difficult and poetic. That is one of the reasons why schools always encourage students subscribe to it. a) The Hong Kong Standard - It's the second English Hong Kong newspaper and the only FREE English newspaper in Hong Kong. If you stay in any Hong Kong Hotel, you will most probably get this one. The year they switched to be a FREE newspaper, my sister just transferred from their Chinese division to the English division. Being the only FREE English Hong Kong newspaper, surprisingly, they make a BIG profit. Also, as of Oct 2012, you can pick up this newspaper at all stations along the Airport Express, one of the Hong Kong MTR routes. b) Hong Kong Headline - This is a FREE Chinese newspaper. It is the subsidiary of Sing Tao Daily. Like the HK Standard, if makes a lot of money even though it's FREE. 3) Paparazzi Type - I NEVER like these newspapers. They publish gory pictures. b) Oriental Daily - This was one of the 4 newspapers my grandfather bought on a daily basis. It was not like the paparazzi type until the Apple Daily came out. They have many subscribers. e) Sing Pao Daily News - My parents are loyal subscribers of this newspaper. f) Sing Tao Daily - My sister worked here for 10 years. It is the parent company of the Hong Kong Standard. Even after moving to the States, I still have the habit of going online to read this newspaper on a daily basis. I especially love their section talking about trendy stuffs, food and so forth. When you visit Hong Kong, feel free to buy a HK newspaper. You will be impressed with how much good quality content there is in a thick stack of paper.